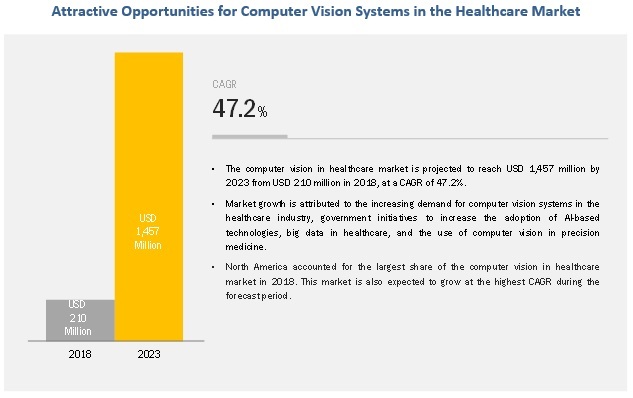 [135 Pages Report] The computer vision in healthcare market is projected to reach USD 1,457 million by 2023 from USD 210 million in 2018, at a CAGR of 47.2% during the forecast period. Factors such as the increasing demand for computer vision systems in the healthcare industry, government initiatives to increase the adoption of AI-based technologies, big data in healthcare, and the use of computer vision in precision medicine are expected to drive the growth of this market. On the basis of product & service, the computer vision in healthcare market has been segmented into software, hardware, and services. In 2018, the software segment accounted for the largest share of the market. Software solutions digitalize healthcare and are integrated with artificial intelligence, which helps healthcare providers gain a competitive edge despite the challenges of being short-staffed and facing increasing imaging scan volumes. This is a major factor driving market growth. The computer vision in healthcare market, by application, is segmented into medical imaging & diagnostics, surgeries, and other applications. The medical imaging & diagnostics segment accounted for the largest share of the market in 2018. This segment is also projected to witness the highest growth during the forecast period. The advantages of using computer vision for medical imaging & diagnostics, such as an increase in quality, accuracy, and predictability and early detection of certain diseases are driving the growth of the medical imaging & diagnostics segment. On the basis of end user, the market is segmented into healthcare providers, diagnostic centers, and other end users. The healthcare providers segment accounted for the largest market share in 2018 and is projected to register the highest growth rate during the forecast period. The growing adoption of computer vision solutions in hospitals and the increasing focus of companies on developing AI and computer vision tools to improve hospital operations are the major factors driving the growth of this end-user segment. The computer vision in healthcare market is dominated by North America, followed by Europe, Asia, and the RoW. The market in North America is also expected to witness the highest growth during the forecast period. The high growth of the North American market can be attributed to the increasing number of imaging procedures for disease diagnosis, growing adoption of personalized medicine, and growing government initiatives for the adoption of AI-based solutions in healthcare. The computer vision in healthcare market is highly competitive in nature, with several big as well as emerging players. Prominent players in this market include NVIDIA Corporation (US), Microsoft (US), Intel Corporation (US), Xilinx Inc. (US), IBM (US), Google (US), Basler AG (Germany), Arterys (US), AiCure (US), and iCAD Inc. (US). NVIDIA is a leading player in the visual computing business. The company has a well-established geographic footprint and deals with major OEMs or ODMs. The company focuses on developing new AI products in the computer vision market. Recently, NVIDIA witnessed a significant increase in its data center revenue. The company mainly focuses on adopting organic growth strategies to maintain its position in the market. For instance, in September 2018, the company launched the NVIDIA Clara platform, and in October 2017, the company launched the NVIDIA GPU Cloud (NGC). In 2018, NVIDIA partnered with King’s College London, a leader in medical research. King’s College London is Europe’s first clinical partner to adopt NVIDIA DGX-2 and the NVIDIA Clara platform. King’s College deployed NVIDIA AI solutions to rethink the practice of radiology and pathology in a quest to better serve 8 million patients in the UK’s National Health Service. In 2018, Intel collaborated with Novartis on the use of deep neural networks (DNN) to accelerate high content screening—a key element of early drug discovery. In 2018, IBM collaborated with NVIDIA to incorporate the RAPIDS open source software into its enterprise-grade data science platform for on-premise, hybrid, and multi-cloud environments. What types of annual and multi-year partnerships are computer vision in healthcare companies exploring? What are the recent trends affecting computer vision manufacturers and independent service organizations? The study involved four major activities to estimate the current size of the computer vision in healthcare market. Exhaustive secondary research was done to collect information on the market, its peer markets, and its parent market. The next step was to validate these findings, assumptions, and sizing with industry experts across the value chain through primary research. Both top-down and bottom-up approaches were employed to estimate the complete market size. Thereafter, market breakdown and data triangulation were used to estimate the market size of segments and subsegments. Secondary research was mainly used to identify and collect information for the extensive, technical, market-oriented, and commercial study of the computer vision in healthcare market. Secondary sources such as directories; databases such as Bloomberg Business, Factiva, and Wall Street Journal; white papers; and annual reports were used to obtain key information about major players, market classification, and segmentation according to industry trends, regional/country-level markets, market developments, and technology perspectives. Computer vision in healthcare revenue generated by leading players has been determined through primary and secondary research.